Situated midway between San Francisco and Los Angeles in beautiful Pismo Beach, Pismo Coast Village RV Resort needs only to be seen to be appreciated. Beautifully landscaped and nestled right on Pismo Beach (currently Pismo Creek is flowing along the resort and it is necessary to walk around the lagoon to get to the ocean), it is truly an outstanding destination RV resort. This award winning, nationally recognized resort is conveniently located within walking distance from downtown Pismo Beach shopping, restaurants, and the famous Pismo Pier. Pismo Coast Village RV Resort features 400 full hookup sites, each with complimentary wireless internet access and cable TV , on 26 acres. Pismo Coast Village RV Resort also offers many great amenities including a General Store, seasonal restaurant, heated pool, arcade, laundromat, bicycle rentals, and miniature golf. Relax to the sound of the surf, scent of the salt air, and the feel of an ocean breeze. 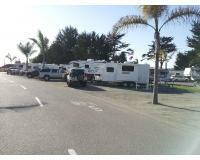 It won't take long to find you have discovered a unique RV camping paradise on the ocean. Longitude -120.63269 / -120º 37' 57"
Latitude 35.13166 / 35º 7' 53"
Really very nice. Went with a group of people and the RV Resort got us all clustered into a group where all of our trailers backed up in a group. Pulled the picnic tables together (3 of them) on the grass (for group dining, etc) The WiFi is non-existent here. They supposedly have a new WiFi transmitter on bathroom #4 (we were 5 sites away from the restrooms) Couldn't get a signal. The store is very well stocked and the laundry facilities were sparkling. They have a little restaurant there that serves a good breakfast (we ate there twice) I'm giving the Facilities a 4 out of 5 stars because of the WiFi situation. The CableTV was about 25 different channels and good reception. Look forward to staying here again, as it's a great place to have a Rally or Club Camping Groups. Also located near the outlet stores in Pismo Beach. Great campground. Pool, Arcade, store, laundramat, playground, comfortable sights, shade. There's free wi-fi and cable. Restrooms and showers are locked and extremly clean, they give you lock combination at checkin. 24 hour security and very quiet from 10 t0 7. Very difficult to get reservations at holiday periods, well worth the cost.